Last fall, Landed launched a partnership with Extra Yard for Teachers to create a giveaway for three lucky educators to each receive $25,000 to help own a home in the Bay Area. Our first two winners were Stephanie Hardinger, an elementary school teacher in Palo Alto, and Beti Magana, a Spanish teacher in Santa Clara. Since winning in November, Stephanie has already bought a home using the grant money she received combined with Landed down payment support. 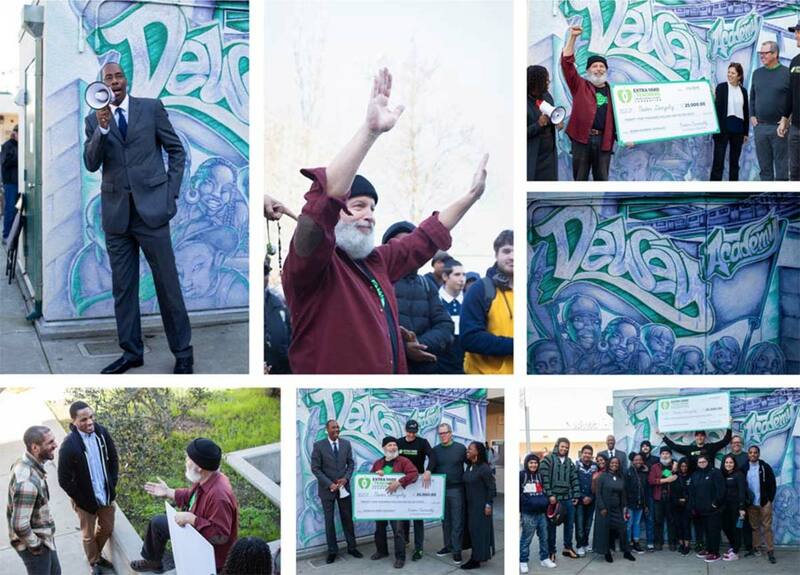 On a Wednesday in January, Landed and Extra Yard for Teachers traveled to Dewey Academy in Oakland to surprise our third grant giveaway winner, veteran science teacher Nestor Gonzalez. Students and staff gathered in the courtyard, where Principal Darrell Ross and Kelley Nayo Jahi gave a brief introduction before presenting Nestor with a check for $25,000. Nestor will have the option to combine this grant with Landed down payment assistance or other down payment assistance programs to put money down on a home in the Bay Area. He plans on finding a home close to the school so he can walk to work and spend more time helping students. “This grant means a lot to me, given the struggles teachers face,” Nestor said. Extra Yard for Teachers awarded an additional $2,500 to the school to further the work educators are doing there. Dewey, a continuation school, offers students with problems at their regular high schools a second chance to earn credits and graduate on time. View the video from Nestor’s surprise! Landed helps educators purchase homes by providing down payment funds. Please click here to learn more about our down payment support, or click here to apply now. Raised in the Bay Area, Jennifer is a senior attending San Jose State University planning to double major with a B.A. in Graphic Design and a B.S. in Advertising. As a MarComm Intern, Jennifer works with the Engagement Lead on photography, videography, editing, writing, and communications.